The mages start the game on top of the tower in the middle of the battlefield. The battlefield consists of six lanes, each with three sectors, radiating out from the tower. On these lanes the orcish hordes will try to charge all the way towards the tower. Your job is to defeat them before they can reach you. 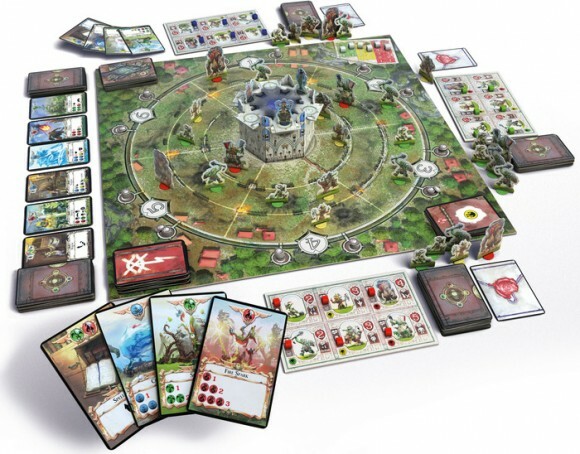 At the beginning of each game round players draw a fate card, which will determine which category of creatures will advance one sector towards the tower and sometimes implement a nasty rule change for that particular game round. There are three categories of orcs which differ in strength and special abilities that are conveyed to a player once an orc is defeated. The game ends when on four lanes you run out of orcs. During the final scoring players count up their defeated orcs and multiply them by the number on the creature counter, get points for each support spell learned and subtract points for each poison card in their deck. Whoever has the most points will be declared "Master Mage"! 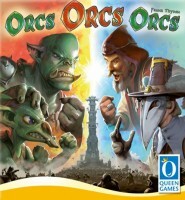 Add a Review for "Orcs Orcs Orcs"